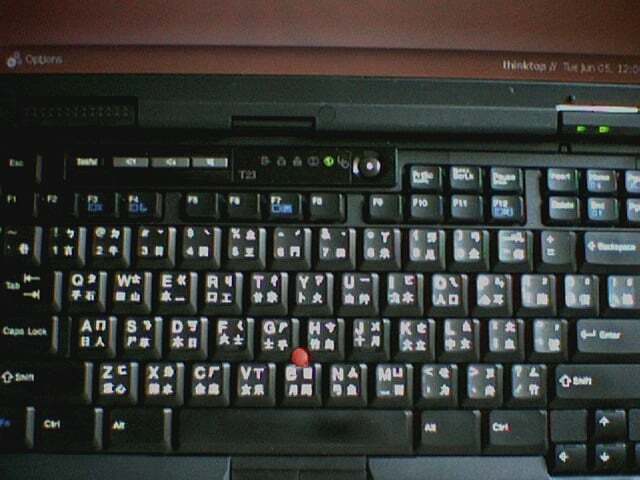 I found some stickers on ebay that let you turn a normal keyboard into a Chinese keyboard. My intention was to learn the Wubi layout, but as it turns out these stickers are for a traditional character input. While they make my laptop look totally pimped out, I don’t think they are useful to someone learning Mandarin / simplified. My teacher says the pīnyīn system is usually the best input system for English beginners anyway. If you are learning Mandarin / simplified, the stickers will not really help you, but it does make your laptop look really cool. The stickers are only a couple dollars so if you are into putting stickers on your laptop, they are worth a look. Here are some tips for putting them on. * When you’re pulling the stickers off the sheet use some tweezers, and grab them from one of the top corners. It makes it easier to get them centered on the keys before you press the sticker on. For reference, here is what the stickers look like (my apologies or the bad picture). In the picture you can (hopefully) see that it says what keys the stickers should go on. Double check the key; the order of your keyboard keys might not be the same as on the sheet. I put the stickers on my laptop. With a laptop, there is an extra bit on the the numlock keys that shows what the keys do when the numlock key is pressed. This conflicts with the stickers. The stickers use that space to display the characters. At first, I tried to scrape off the numlock items with a razor blade, but it started putting grooves in the keys. I could feel the grooves with my fingers when I typed, and it was annoying. The best way I found to remove the numlock items is to just color over them with a sharpie.